The 8 inch triangle by Gear4music is a great addition to percussion ensembles. This large sized lightweight instrument makes it ideal for most percussion ensembles as well as for schools. The lower pitched tone created with the included beater makes it suitable for almost all ensembles. 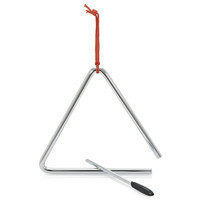 The triangle can be easily held or hung on a stand with the included string.